Update 02/18/09 - This Range Rover has been relisted on Craigslist with different pictures and a lower price of $11,000.00 - Click here to see the new listing. In 1998 Range Rover commissioned Callaway Cars to do a limited run of Range Rover 4.6 HSEs. Not turbocharged as many of Callaway's cars are, Callaway instead modified the engine by increasing the compression ratio from the stock 9:35:1 to 9:60:1, increasing airflow through the cylinder head, tweaking the ECU and much more. (For the complete list of modifications, click here to see a Wiki article) The result was that the Limited Edition Callaway Range Rover 4.6 HSE produced 240 bhp and 285 lb. ft. of torque, an increase of over ten per cent from the production 4.6 liter V-8. 0-60 times dropped from 9.7 seconds to 8.6 seconds. Very nice for such a big, heavy vehicle. The Range Rover being offered on Craigslist has 80,000 miles on it. Recent maintenance has been done. The listing has very little info and just 1 picture (the one seen above), but the seller gives a phone number to call for more info. This is the ultimate Range Rover 4.6 HSE and one that may, in time, become a genuine collector's item. 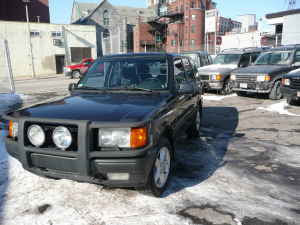 Located in Boston, MA, with a price of $13,000.00, click here to see the Craigslist ad. Click here to see the Callaway Cars website.